Reader Question: I'm interested in using acrylic on wood without priming with white gesso. I would like the wood grain to be visible and part of the painting itself. What product would you recommend that would seal and protect the wood before applying the acrylic, but that would remain transparent? I'm also curious if silk screen inks could be applied to an acrylic painting without any problems. 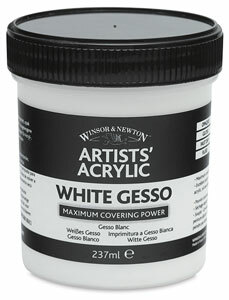 Clear gesso is just like regular gesso, except that it dries clear! Matte medium is another excellent option that can be used as a clear ground, while also protecting the surface of the wood. Yes! You can safely add screen-printing ink to an acrylic painting, either by brushing it on or by doing a screen print over top of your acrylic painting. I've done both. Screen-printing inks work best when they are used for their intended purpose (screen-printing) but I was able to use my leftover screen-printing ink by brushing it onto a canvas. It took a few coats to get smooth and even coverage, and the screen-printing ink was thick and goopy compared to acrylic paint, but it was an easy way to use up what I had left. You can also create some cool effects by screen-printing some designs or images over an acrylic painting. Hope that helps & Happy-Artmaking!